Note: the resources here are helpful, but you shouldn’t rely on them. Memorizing the notes on the fretboard is an important skill every guitarist should consider working on. If you learn how to memorize the notes on the fretboard, you’ll never need resources like these again. Looking for the A minor scale? For every Major scale in music, there is what we call a ‘relative’ minor that uses the exact same notes. This means for every Major scale, there is a minor scale using the same notes. The C Major scale and the A minor scale both use the exact same notes. The main difference between the two (to keep things simple) is the root note of each scale. In the C Major scale, the root note is ‘C’. In the A minor scale, the root note is ‘A’. This means you can use all the diagrams, exercises and chords covered in this page for both the C Major scale and the A minor scale. The main reason why the C Major scale is usually the first scale to learn is that it has no sharps or flats. It makes it easier to read on sheet music and easier to find the notes on the guitar. If you’re ever at a piano and want to noodle around, you can play the C Major scale if you only play the white keys. On a piano, the black keys are the sharps and flats. The notes in the A minor scale are: A B C D E F G. As you can see, it’s the exact same notes as the C Major scale. Pay extra attention to all the ‘C’ positions as C is the root note of the scale. If you don’t know how to use the above diagram, keep reading as we will look at some basic exercises to get you playing the C Major scale. The C Major scale is the most important scale to learn so it’s worth spending the time to memorize the above notes. Try playing the four examples to get a feel for how C Major sounds and where the correct notes are on the fretboard. Then use the fretboard diagram and try finding different scale positions. Play the scale runs up and down as an exercise to get you used to the positions. You might already know most of these chords as they are the most common open chords on the guitar. Don’t worry about the last chord (Bdim) as you’re unlikely to use it. Try making up some chord progressions using the above chords and listen to how they sound when played together. A lot of songs use the above chords so you may find you accidentally play a progression from a well-known song. Note: remember that the A minor scale uses the exact same notes as the C Major scale. This means the above chords also fit in the key of A minor. As mentioned earlier, you shouldn’t rely on these resources. Learn how to memorize the notes on the fretboard. 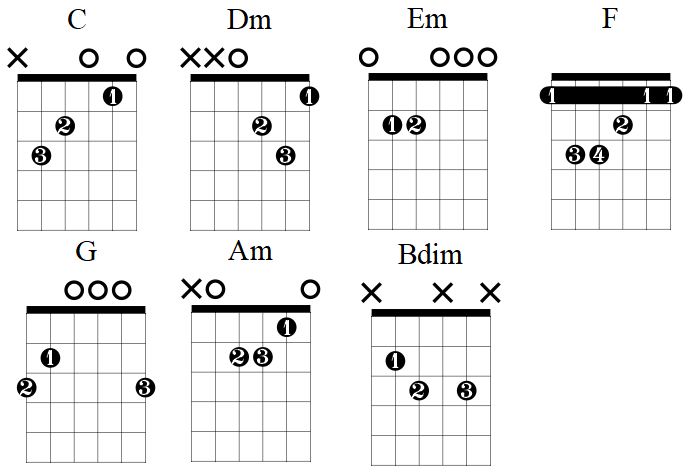 It might be easier to use a chart like the ones above to find your way across the fretboard, but you’ll become a far better guitarist if you properly memorize the fretboard notes.